St. Ann's hospital is a former large residence which has been converted into a hospital. Dr. Louis Letheny lives in the "doctor's cottage" on the grounds, with his cousin, Corole Letheny. She hosts a dinner party there one evening where the main topic of conversation is the extravagant spending by the hospital administration. An example is the recent purchase of 1 gram of radium for $65,000. (And this is in 1929, when an entire ambulance costs $8000). Nurse Sarah Keate returns to the hospital for the midnight shift after the dinner party. A sudden storm rolls in, and she is surprised by seeing some object fly out a window nearby - then the power goes out. By candlelight, she discovers elderly Mr. Jackson dead in Room 18 - he had been receiving a radium treatment (which consists of taping the radium to the skin for a while, a bit cruder than today's radiation treatments). The precious radium is missing. Attempts to find Dr. Lethany are unsuccessful, and he is initially suspected - until his body is found in the locked closet of Room 18 - victim #2. Debonair detective Lance O'Leary arrives on scene to head up the investigation. Everyone is on edge. Janitor Higgins confesses to Sarah Keate that he saw the murderer, but rushes off without naming the person. Then the lights go out again, a shot is heard, and Higgins is found dead .. in Room 18. Sarah Keate stumbles across the missing radium, and gives it to O'Leary. Before he can get it to the police station, he is hit on the head and it is stolen again. "Here is the coffee," she said huskily. "As coffee should be: black as night, hot as hell, and sweet as love." The action is page-turning Mignon Eberhart. Storms, fog, people lurking in and out of windows, dark corridors, strange noises. Suspicion points at each person in turn, until Lance O'Leary sets a trap for the murderer with the aid of Nurse Keate. This is the first Nurse Keate novel, and sets the stage for further episodes of the two. A little longing-from-afar from Keate's perspective, but she is much too professional to let anything romantic progress along that line. The hospital takes us back to an earlier day when nurses wore caps, capes, crisp white uniforms, and stockings - no ugly baggy scrubs here. The facility is certainly laughable by today's standards (open doors, no emergency lighting, loose radium, each nurse has her own personal hypodermic syringe, lots of morphine and ether, one telephone per floor, open unscreened windows) but remember this is 1929. One thing I like about her books, and this one especially, is the limited cast of characters. 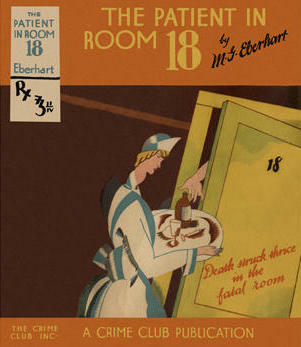 Other authors load us up with throwaway 1-dimensional red herrings just to fill out the suspect pool, but not Eberhart. Each character is here for a purpose. Speaking of red herrings, there are a few and I was convinced they were the real deal; but I was fooled. The denouement reveals the killing/radium theft was a complex shell game - I confess a bit too complex for me to follow without mapping it out - but it comes to a satisfactory conclusion. Also see this review by Bev Hankins on her blog, My Reader's Block.